Completely sequenced prokaryotic genomes continue to become available at an ever-increasing rate in the primary databases, and as genome annotation standards still differ widely, there is also an escalating need for tools which undertake rigorous and consistent analysis across all genomes. In prokaryotes, transcription factors (TFs) and two-component systems (TCSs) are involved in the control of multiple biological processes, and the identification and categorisation of these regulatory proteins (RPs) are critical to understand their functions. We have designed P2RP, a freely accessible web server, to provide a platform for RPs prediction. 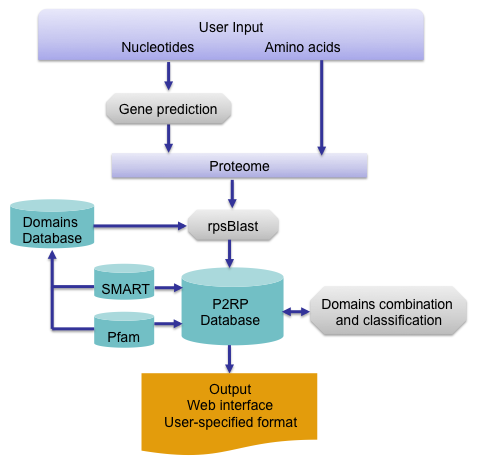 The program can perform several types of analyses depending on the type of request, and provide detailed annotation of each RP gene including classification, sequence features, as well as functional domains. Data can be outputted for download in a variety of specified formats. Barakat M, Ortet P, Whitworth DE.